Do you crochet? Are you interested in learning some new techniques and designs? 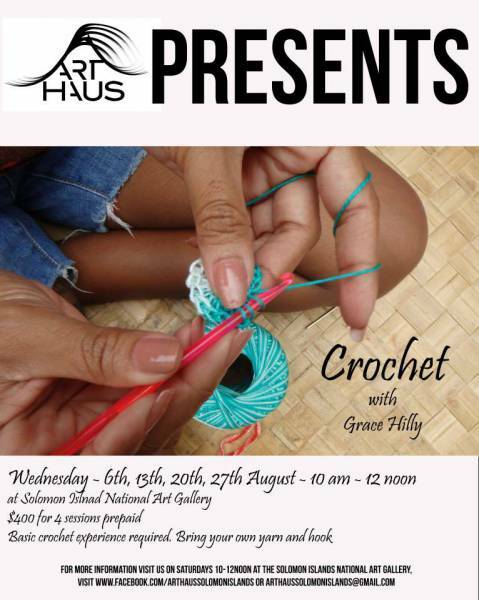 This is a unique chance to learn secrets from Grace who currently sells her work throughout Honiara. This workshop series will take those with basic crochet knowledge to another level sharing new techniques and designs. Grace, of Western Province, has been crocheting for over twenty years and is a master of techniques and styles from around the world. She is known for her crochet fashion items such as swimwear and earrings. Grace was recently been featured in Stella Magazine for her unique wares usually on sale via fb at Mere Market or through Lexi Designs.